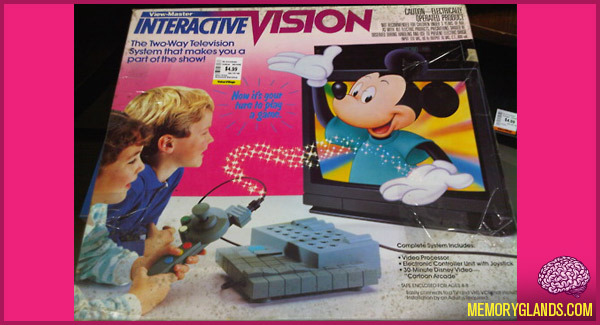 View-Master Interactive Vision is an interactive VHS console game system, introduced in 1988 by View-Master Ideal Group, Inc. The tagline was that the console was “the Two-Way Television System that makes you a part of the show!” The titles included four Sesame Street games, and two games featuring the Muppet Show characters, as well as a Disney game, Disney’s Cartoon Arcade. The system came with a simple controller which included a joystick and three colorful buttons. As the video plays, the characters address the player directly, and ask the player to make a choice by pressing one of the buttons.